The Yamaha R15 was recently updated with dual-channel ABS and a new Darknight shade which asks for INR 2,000 more, over its blue and red painted variants. Showcased alongside the recently launched FZ Version 3.0, it did look pretty impressive in its all-black attire. However, this particular example from what appears to be a southeast Asian country looks meaner. Where the Darknight shade we get carries its chrome finished sticker work with pride, the stickers on this particular bike have been deleted altogether. Moreover, the panel near the tank lid is the only bit finished in glossy black while the rest of the bike is finished in a shade of dark matte black. The LED headlamps appear to be smoked, there are some aggressive extensions which have been added beneath them, the front blinker stems have been replaced with flush fitting after-market units and the ones at the rear have been neatly integrated under the LED taillight. Do not miss the unique radiator and the front disc brake fluid container cover. Oh, this Yamaha R15 also has something we don’t get – upside down front forks! 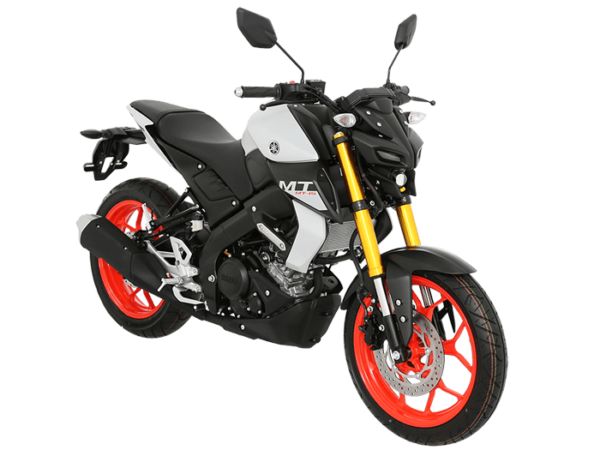 In other news, for those who were disappointed that Yamaha did not launch the MT-15 as rumoured and introduced the FZ version 3.0 with a not so powerful engine, there is good news. The naked R15 is tipped for launch in the month of March 2019. However, like the fully-faired motorcycle, it won’t get USD forks either and will skimp on some other bits too. But the motor and most other things will be retained in a street-friendly package. It will be interesting to see how Yamaha positions the motorcycle because the new FZ-S retails at INR 95,000 Ex-showroom, while the hike in cost due to the addition of ABS has hiked the R15’s price to INR 1.39 lakh.